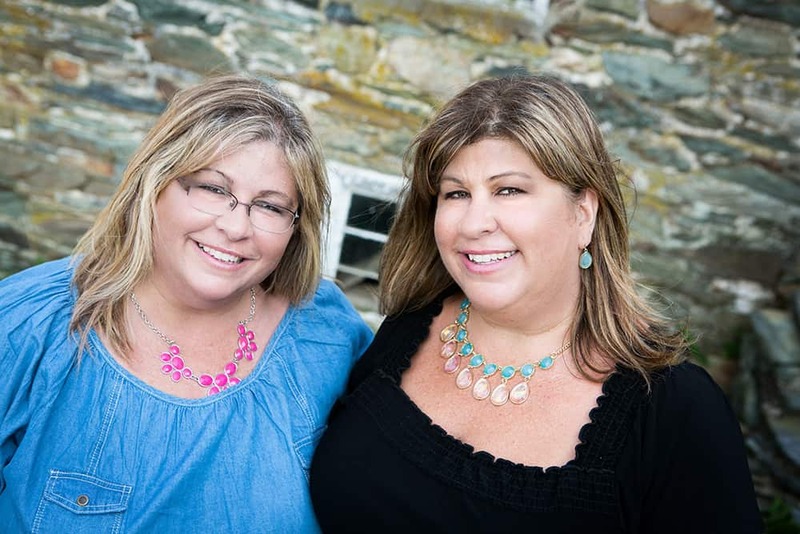 So as you already know if you’ve read my 10 Ways to Keep Your Hair Healthy and Beautiful Through Your 40s and 50s post, I have recently begun paying extra special attention to my hair. My hair has always been one of my best assets. I’ve gotten many compliments throughout my life on how pretty it is. It’s not something I brag about. I’ve actually taken it for granted for way too long. Now that I’ve reached middle-age, it’s something that I’ve needed to take extra care in maintaining. If I don’t have my hair, I lose my identity. Sounds dramatic, but it’s true. I’ve never been one to purchase salon hair products because of the cost. 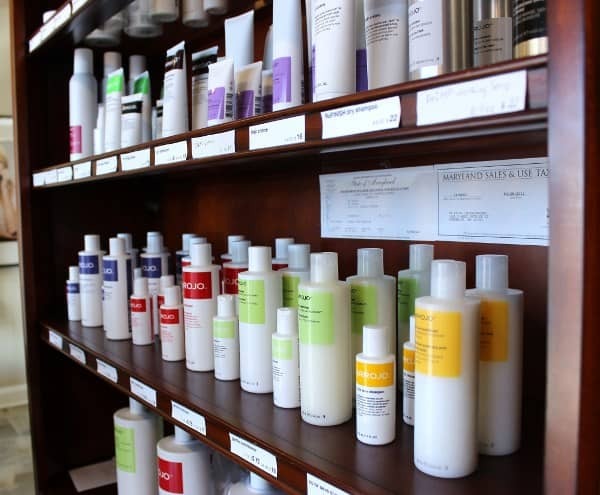 By the time my stylist is done coloring, highlighting, cutting, washing, and styling my hair and I take that dreaded slow-motion walk to the cash register, thinking in my head, ‘How am I going to explain this one to my husband?’, the last thing I want to pile onto that bill is an arsenal of pricey hair products. Not that my stylist isn’t reasonable. As a matter of fact, in my opinion, she’s the best deal in town for the service that I receive. Over the last year or so, I haven’t been able to find anything at the drugstore that was capable of mending my broken hair and bringing back it’s luster. My stylist recommended that I try out a few products from their Arrojo line. I decided to spend a little extra money (and by the way, Arrojo products are very reasonably priced compared to other brands of salon products) to see if it makes a difference with my hair. I purchased the Arrojo Defrizz Serum, the Arrojo Protective Thickening Lotion, and the Arrojo Cream Whip. My stylist even told me the ‘recipe’ of how to use it. I left the salon with my arsenal and started my journey to beautiful, healthy hair. 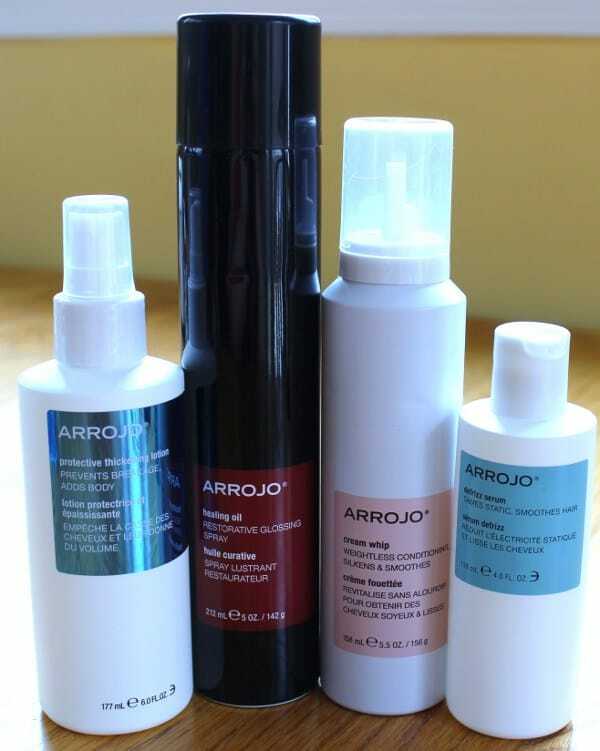 I received new bottles of Arrojo Protective Thickening Lotion, Arrojo Healing Oil, Arrojo Cream Whip, and Arrojo Defrizz Serum. And just so you know, I won’t review just any product. I review products that I already know I love and that I want to pass on to you, my reader. That’s just how I roll. So you can be assured that I’m not trying to influence you to use something that I don’t truly think is worth the money. The Defrizz Serum is “a soft, silky and calming no hold product that eliminates frizz, controls fly-aways, and eases excess volume. Infused with a lavender pear fragrance blend.” It can be used on wet hair as well as dry hair. I use it after I towel dry my hair. I pour a little more than a quarter size amount (because my hair is thick and I have a lot of it) in my hand and rub my hands together. I then apply it all throughout my wet hair. The links for the below products are Amazon affiliate links. If you click on them & make a purchase, I will receive a very small percentage – like a few cents. However, this does not affect the price you pay for these items. 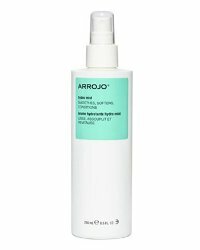 I also have the Arrojo Hydro Mist and use it during those times that my hair is feeling extra dry and I need some extra hydration. I decided to test out my new arsenal of Arrojo products with my stylist. I brought the products along with me for my much needed color, highlight, & cut. 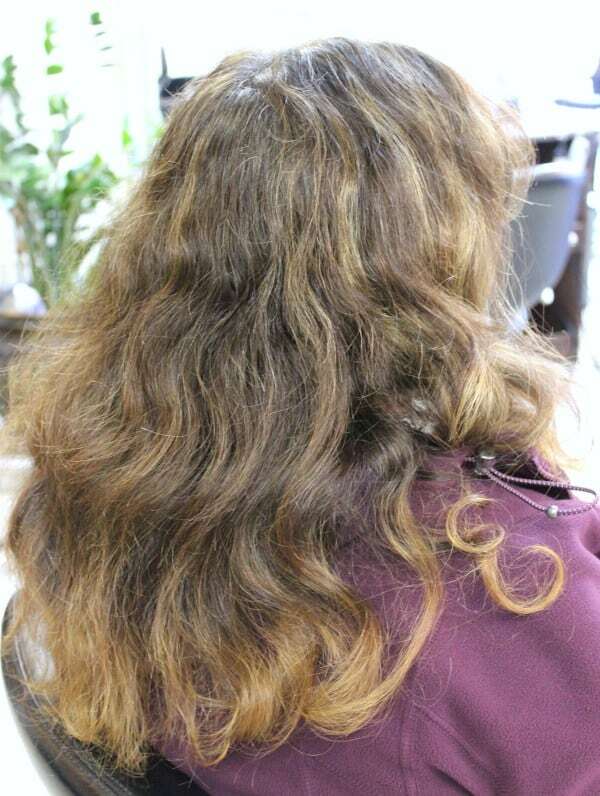 My stylist took the below picture of how my hair looked before any cutting, coloring, highlighting, or adding of products was done. As you can see, it was in desperate need of some TLC. 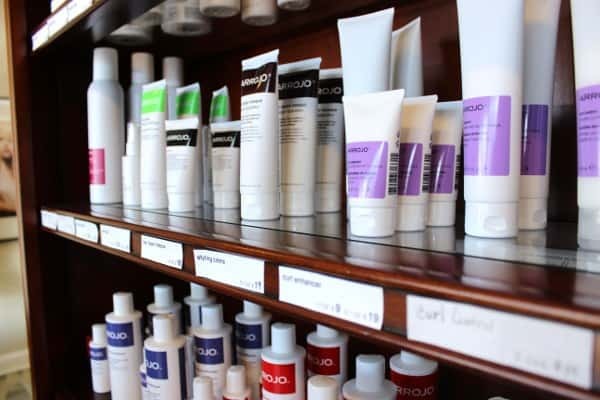 Arrojo products are my stylist’s main line of hair products in her salon. She offers many of their products for all different hair types. As you can see from the photo below, that is my ‘After’ picture. Colored, highlighted, cut, styled, and products applied. Ahhhh, you just can’t beat a good hair salon day. Can you see the shine and how much healthier my hair looks? And by the way, if you live in the Frederick area and are looking for a good stylist, give Maria a call. She’s the owner of PK Salon. Here is their Facebook page. Both Tin and Maria (they are a married couple) are trained by Arrojo and are Arrojo ambassadors. 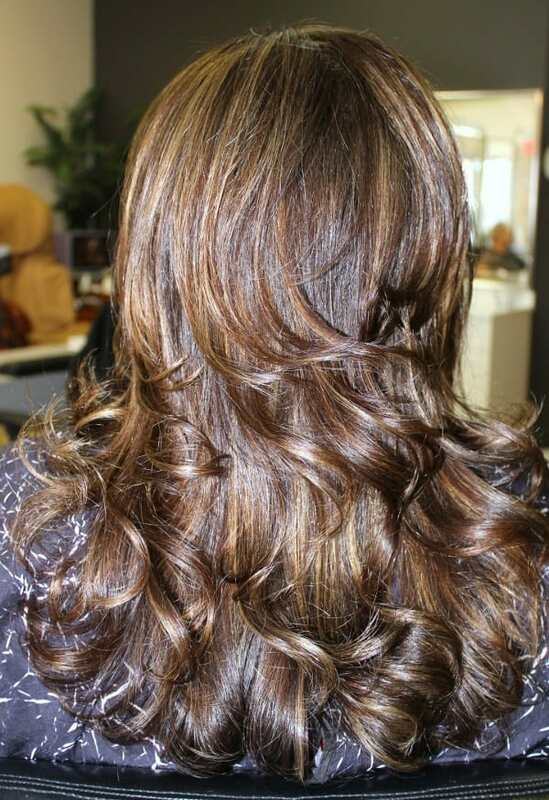 PK Salon is located at 1425 D West Patrick Street, Frederick, MD 21702, (301) 696-9492. 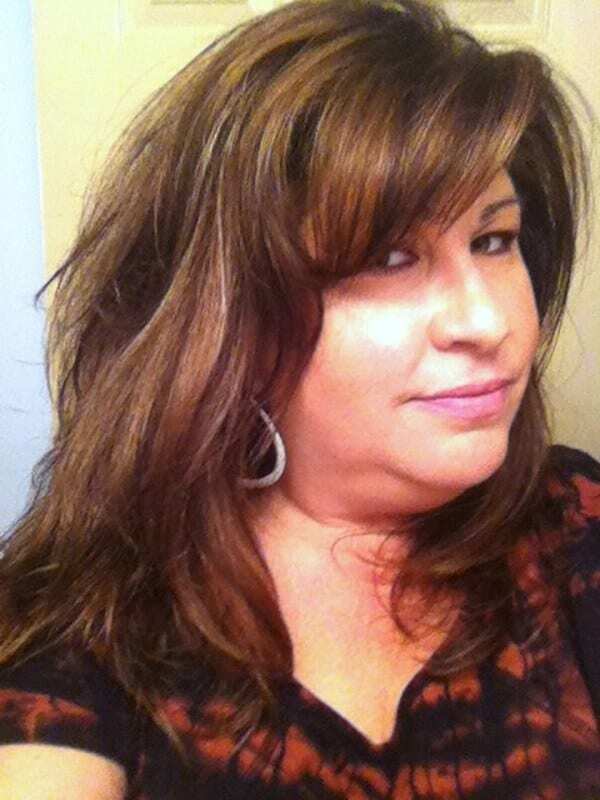 I’ve been going to Maria for 14 years and love how personable and comfortable the salon is. They also keep up on the latest styles, techniques and products, including of course Arrojo. 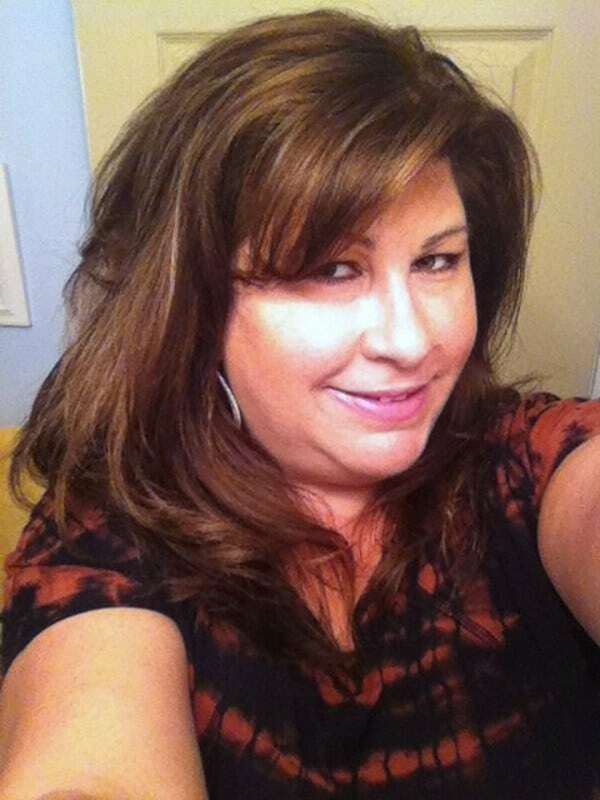 More pictures of my hair after the salon treatment. The above picture is my favorite. Since Maria is a stylist, I don’t think I could get close to styling my hair the way she can. Although, she is always more than willing to give me a styling lesson. So to prove that the Arrojo products are just as good at home as opposed to in the salon, I included some photos below of my hair after I styled it myself and after using my Arrojo arsenal. I could have sprayed on a little bit more of the Arrojo Healing Oil to add more shine but I was trying to be conservative so that I didn’t over oil it. Next time I’ll spray more. Keep in mind that this ‘recipe’ of products is specifically for my hair type – color-treated, thick, coarse, and a little frizzy hair. If you have thin or fine or oily hair, you may need a totally different set of products. Arrojo has products for every type of hair and I am confident that they are just as good as the Arrojo products that I have used thus far. I’ve also used Arrojo’s Curl Enhancer for days I want to show off my natural wave. As with the rest of the Arrojo products I’ve tried, the Curl Enhancer is a wonderful product. 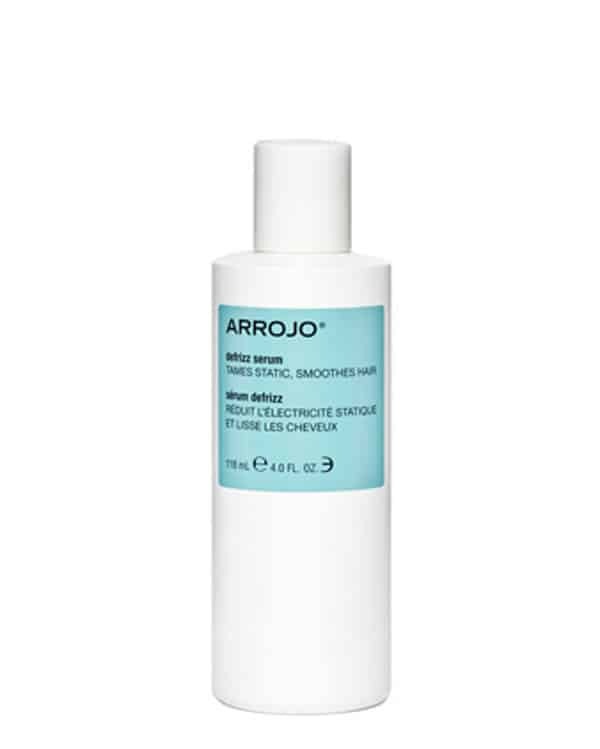 One extra side note about all of the Arrojo products is how good they smell. They all smell clean and fresh. I can’t say enough great things about them. 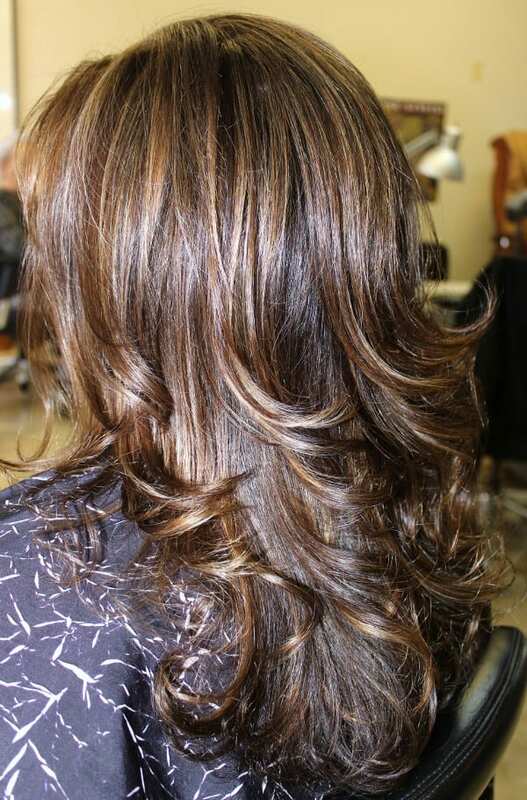 If you’d like to try Arrojo for yourself, stop by PK Salon and ask Maria for recommendations. Or email Arrojo directly and they can tell you what you’ll need. 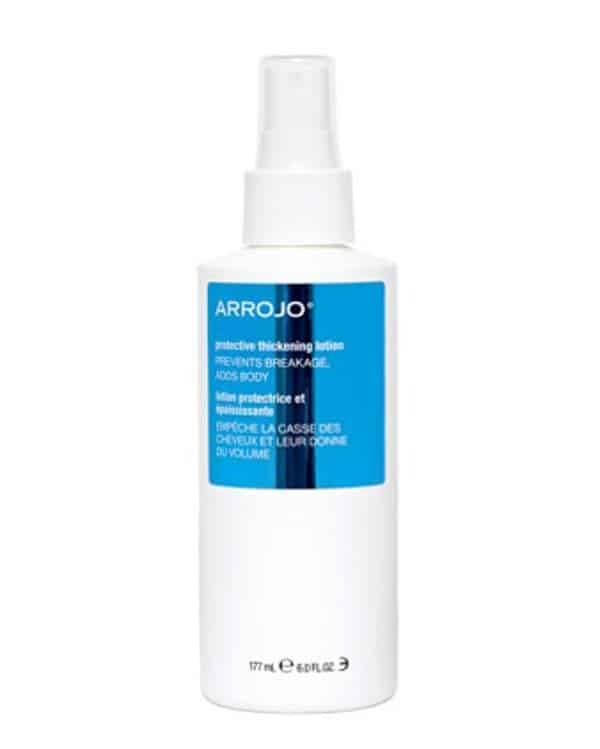 You can order products directly from Arrojo’s website or purchase them from PK Salon. DISCLAIMER: I received the above products for free in exchange for writing this review. However, the expressed opinions in this review are solely my own. Great article as usual! You and I have very similar hair and you have definitely intrigued me. I have had a very hard time trying to find something that will take the frizz out and allow me to air dry it. Did you by chance try air drying it? Thank you Pam! I have air dried it with Arrojo products and it works well. Since you and I have similar hair, I would recommend you get the Defrizz Serum. And if you use a lot of heat products like curling irons and straight irons, I’d also get Protective Thickening Lotion to put on before you dry your hair. It really protects it from damaging your hair. You and your hair look great in these pictures!! From the looks of your hair, these products definitely work. Thank you Cheryl! They really do make a huge difference. And they protect my hair from further damage from the heat tools.